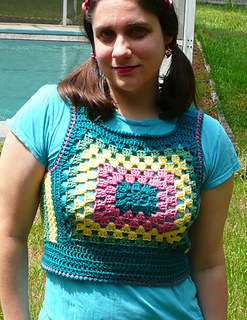 to fit chest sizes 30" to 44"
This tight-fitting vest is built around a traditional granny square. Pattern from the 1970s is for men or women. Red Heart gives women’s finished chest size of 29 (32, 35)” and uses 1 skein each of Red Heart Super saver in four colors.